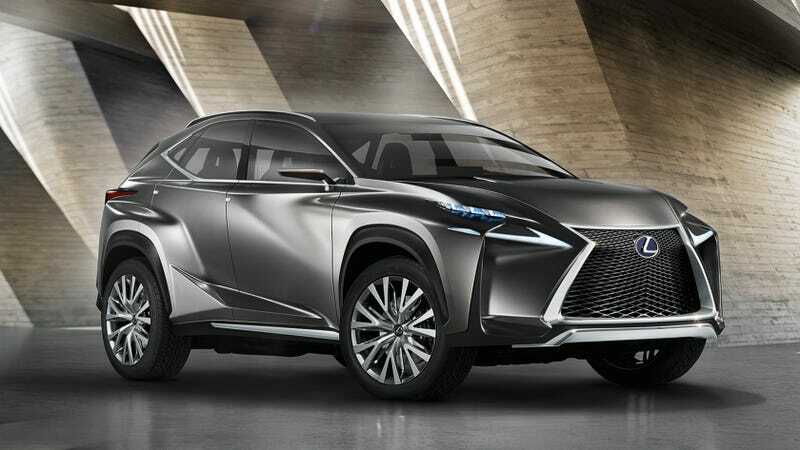 Instead of casting Chinese cars for Transformers 4, Michael Bay should take a look at this: the Lexus LF-NX crossover concept, set to debut at the Frankfurt Motor Show next week. It's certainly closer to being an Autobot already. Let's play a game! If you would have to guess what we see here, what would you say? That it's a hybrid to make it "green," right? Damn right! It's also a car with the front of a JDM Toyota Crown turned upside down, and LEDs of course, framed by the Brushed Metal Silver exterior color to make it look like it's been carved from a single piece of solid metal. I'll take Lamborghini's Sesto Elemento, thanks very much. How about the interior than? It's luxurious of course, with leather and ambient lighting all around to put you in a good mood. Lexus calls it ‘Human Oriented,’ which is great since it totally makes sense to orient an interior around the driver, and not something like a dog or a smartphone. It also comes with touch-sensitive electrostatic switches, and a new touch pad which looks like a fun gadget.